In an hilarious episode of Fawlty towers called "The Wedding Party", Basil Fawlty decides to put an end to amorous dealings in his hotel. It's side splitting stuff-on TV- in real life another matter. At a guesthouse I recently stayed at, the owners were a husband and wife couple. Check in with the wife, went smoothly, my room was in order and I was given good advice on where I could have dinner. Then I met the owner. He decided within minutes of meeting me, that I was after his wife. He muttered to me: "I am watching you" motioning his hands to his eyes and to me. At this stage, I had no idea what he meant. Having realised that I had left the Internet password in my room, I asked the wife who had provided it on check in if I could have it again. The husband at this point demanded that I only speak to him and not his wife. In fact, he ordered me not to talk to his wife again-saying that I needed to be careful. I never spoke to the wife again. This led to an evening of harassment. Every time "Basil" passed me, he would say "I am watching you" as he walked past me. At one time he called out across the lobby/lounge area: "Australian, I am watching you"
As I was working on my laptop, (there was no Internet in the rooms), he came over to me, leaned over me and said: "you look nice. Good clothes"
He said : "Planning on a date tonight? Or were you planning a date and I stopped it?" I gave him a withering look and said that I had not even thought of planning a date with anyone. I didn't speak to him again and went to bed half an hour later. The next morning I saw neither of the couple as one of their staff was covering the morning. 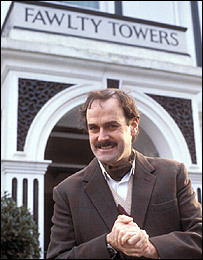 When John Cleese and Connie Booth were writing Fawlty towers, they spoke to people about real situations, hoteliers and guests had experienced. My incident would lend itself to an appearance. As I said, it's funnier on TV than in real life though. Anyone else experienced unpleasant or harassment behaviour from a hotel owner?